A 36 foot lifeboat breaches a wave. These were rugged boats!! 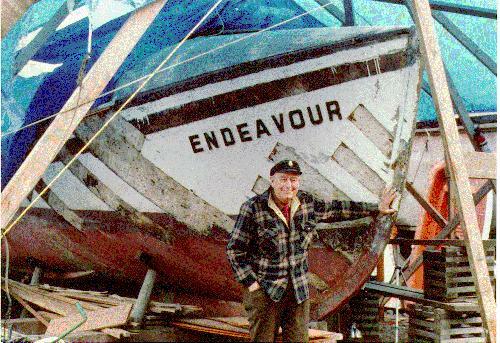 Endeavour started her long and colourful career as a rescue vessel in the U.S. Lifesaving Service (predecessor to the Coast Guard), stationed at Point Adams on the Columbia River bar in Oregon. She was built in 1909 by the Electric Boat Co. in Bayonne New Jersey as a lifeboat (surf rescue boat), one of some half a hundred such vessels shipped by rail to lifesaving stations around the country. This was an early self-righting design, one of the first lifeboats designed for an engine. When the going got rough though, the vintage engine was too cantankerous to be trusted, and the boat would be rowed by the 10 oarsmen, the skipper manning the 2-handled crank that turned the steering gear. These were rugged boats indeed, as attested to by Capt. McLellan's original building specifications that I obtained with Endeavour. Endeavour was stationed at the Point Adams Station, and may have been the vessel from Point Adams that responded to the famous wreck of the Rosecrans, on Peacock Spit, January 7, 1913. 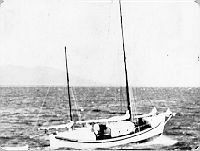 Sixteen men received the presitigious Gold Lifesaving Medal for their efforts, including Alfred Rimer, who later accompanied Amos Burg in his canoe journey over the Columbia River bar in a vessel identical to Endeavour. Endeavour came out of service about 1928, purchased at surplus by Captain Oliver P. Rankin of Astoria, a retired Columbia River bar pilot. Capt. Rankin had her converted into a fine ketch, "a thing of beauty that would last forever". In 1938 Rankin turned Endeavour over to his old friend Amos Burg, a writer, filmaker, and explorer, who had first gone to sea with Capt. Rankin as his cabin boy aboard the steamer Rose City in 1917. Burg used Endeavour as an exploration platform and as his home, for many years. 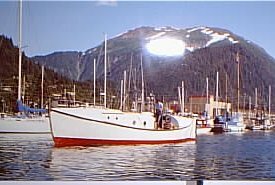 An article in the June 1947 National Geographic ("Endeavour Sails the Inside Passage") describes one of Amos Burg's many adventures in Endeavour. Although a number of the newer (1930's and 1940's) model of a 36 foot lifeboat are on static display on the west coast, these are of a vastly different design, beamier, and carvel planked, instead of double diagonal, as in Endeavour. 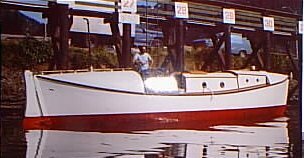 There is only one other lifeboat of Endeavour's era in the country that I have been able to locate, the "Sea Witch" of Everett, WA, owned by Dan and Marion Martin of Everett Engineering. That one is fondly remembered by many generations of Sea Scouts in the Seattle area. I purchased Endeavour in 1982 from Amos Burg, here perched by the bow during the major reconstruction (most of the remaining planks you see here came off too! ), in fall 1983. The restoration was an enormous undertaking, replacing over 35% of the outer layer of planking, about 15% of the inner layer, all with Honduras mahogany, the original material. She's afloat again and in limited use, although the sailing rig is not completed. 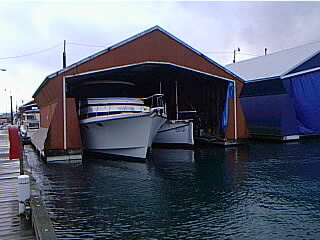 Replanking, new decks, cabin tops, interior, bulkheads...it has been a big project! Here she is after my major hull rebuild in the early 1980's. She'd been hauled out at Noreen Shipwright from May 1983 through spring 1984. More detail on Endeavour's story! 1938-1982: Amos Burg's explorations in Endeavour. Identical to Endeavour (and perhaps it is her), a 36 foot lifeboat breaching a wave. These were rugged boats!! Amos Burg heads Endeavour out over the Columbia River bar, in 1939. Up on the tide grid in Juneau. The forward and aft turtledecks are part of the original U.S.L.S.S. design. The main cabin was added in the early 1930's by a Finnish shipwright in Astoria, working for Capt. Rankin. Beautiful joinery! The forward cabin (galley) was added in the early 1950's, to replace a lower, but very shipshape doghouse. You can see the steering shaft over the top of the aft turtledeck, leading back to a cast bronze rack (quadrant) and pinion gear. The forward end of the steering shaft originally terminated in a two-handled crank, long since gone. I'm resting my arm on the wooden wheel I use. The original shaft setup could slide forward a few inches, releasing the rudder to be hauled up the long pintle/gudgeon rig with a tricing tackle for beaching. "Endeavour Sails the Inside Passage", by Amos Burg. National Geographic, Volume XCI(6), June 1947, pp 801-828.